Turkish Angoras have small to medium bodies that are long and graceful. 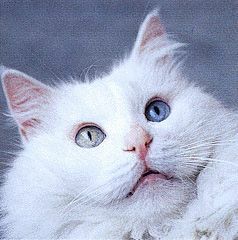 Although white is the most common color for Turkish Angoras, these cats come in many different colorings, including black, blue, smoke, and tabby. These cats have semi long, silky coats with no undercoat. Intelligent and curious, Turkish Angoras are very fascinating and playful cats. As devoted and affectionate animals, Turkish Angoras form deep bonds with their owners and are excellent companions. This breed of cat has been present in Turkey for hundreds of years. Turkish Angoras were likely transported to Europe and North America by sailors during the sixteenth century. Although this breed nearly disappeared completely, Turkish efforts during the early 1900s to preserve these cats were successful. Now, although the breed is still relatively rare in North America, its popularity is growing steadily. Also known as the Ankara Cat. Turkish Angoras love to be the centre of attention and thrive on human company. This type of cat has a very gentle disposition and does well as an indoor pet. Very intelligent, Turkish Angoras are trainable cats; however, Turkish Angoras are also very good at training their owners to do things like play fetch with them. Turkish Angoras are playful cats that remain active throughout their lifetime. Turkish Angoras are affectionate cats that will form deep bonds with their owners. While they may not like to be held for long periods of time, these cats like to be around people and will often follow their owners around the house. For a loving and playful feline companion, a Turkish Angora is a great choice.